I wish I could give you a report along the same successful results as Alan at Chew. Afraid not, it is still rock hard at Farmoor and to prove the point I was the only boat out and the bank fishers gave up late morning. I tried all the obvious line formats and lures with out a touch from a trout. The fish finder was keeping me company and it was showing a mass of bait fish shoals ( my guess perch), I did try to sneak a big perch but that did not work either. The issue is the water temperature is still high at around 20, Mark the Warden summed it up. 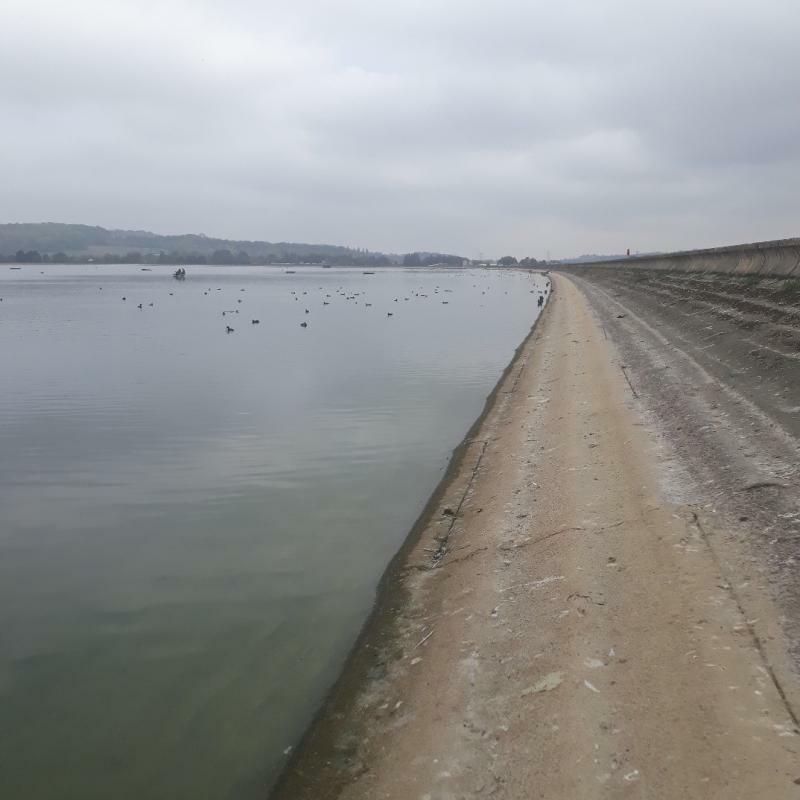 A concrete bowl, clay bottom and warmish Thames water coming into the reservoir maintaining the warm water, Farmoor takes a long time to warm up after winter and will no doubt take more time to cool down after the heat wave. I am off to Cornwall on Sunday so fingers crossed it may have cooled down on my return. Sorry to hear Farmoor is still out of sorts but it will pass. I'm already looking forward to our now annual winter back drifting trips for bars of silver that refuse to give up! Both F1 and F2 are fully open with F2 allowing c&r - lakes have been stocked and reports that fish are on the fry. Good news indeed and great respect for putting fish conservation before profit. 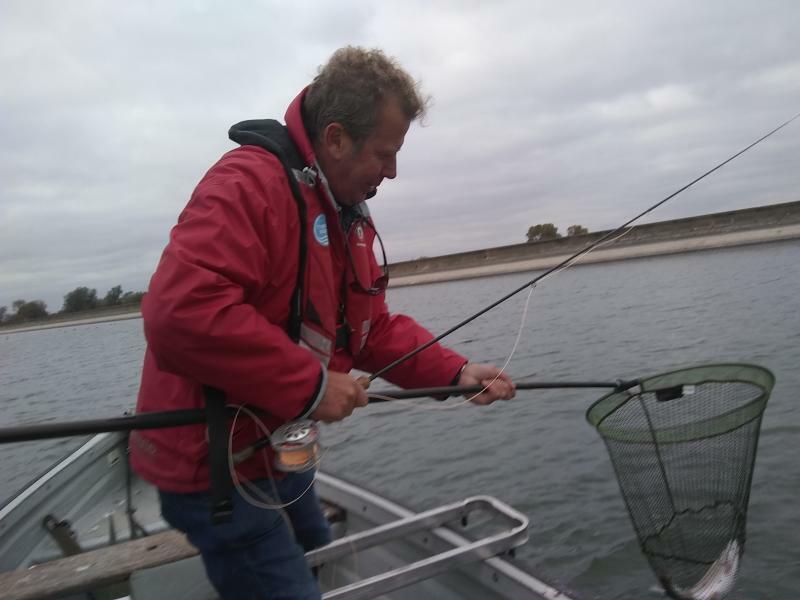 Today was my first trip in October to Farmoor for some bank fishing, the water levels are down and the water is clear but there is some colour in the water in both bowls. There seemed to be a lot of new stock fish rushing around. I did not start connecting with fish until late afternoon as I was fishing nymphs, others were on lures and those were being chased by the stockies. In the afternoon a hatch of very small white flies appeared which I have never seen before there, plus others hatching which bought the fish up to feed sub surface. My fishing day was a tad mixed as I got board waiting for the trout, so I took the lure rod to the Thames and fished for some Perch and caught around 10 but nothing bigger than about !.5 lb, then went back to the trout. I packed in at 6 just as it looked like the fish would start on the dry fly but the M40 was calling. There has been a massive explosion of perch fry in Farmoor there are millions of them swimming along the margins. Unfortunately the cormorants are there in number, I counted around 70 just on the F1 bowl so not sure how long the perch fry will last considering all the things trying to eat them. Another tough day boat fishing on Farmoor 2 today. The fishing in the morning was hard we went in at lunch with out any sign of fish feeding and not having a pull. The afternoon looked more promising as we headed out to the west bank as there was at last a bit of breeze and ripple. We rose some fish to washing line, white boobies on the point and I finally connected with two fish but when the wind dropped the fish disappeared again. Apparently No 1 is fishing better as the water temp is lower than no 2. The water in 2 was a tad green with reduced clarity. Thanks for the report Peter - hoping it turns on soon. No 1 is worth a try especially if the weather cools this week. I have purchased a new ten foot 5 # for the nymphs and dries and I used it yesterday and it was perfect with a five double tapper. My only two fish of the day were on it and the first one was a good three pound clonker and it put a full bend in the new rod. Watch out for the Farmoor Flu which all the Rangers seem to be coming down with or already got. Decided to take a solo boat today - on arrival I bumped into an old friend who joined me on F2. We motored across to the NW corner with a light westerly wind and good clarity down to 6ft or so. Set up a floater with straight nymphs and set a drift toward the observation tower. Not long into the drift had a good take which resulted in a feisty fish of about 2lb to a pearly cruncher. Back in and another good take which was a double hook up. The bigger fish on the point went one way with my fly and part leader whilst the other fish took the middle dropper which was a red holo db. Next was Gerry's turn with another fit 2lber. Back to the top of the drift but the wind had come round a point or two from the north and the takes dried up for the next couple of drifts. We decided to tie up to a bouy for an hour or so and winkled out another couple of fish. Wind came back into the west and eased so we went back on the drift picking up more fish to 3lb. Ended up with 8 and Gerry 4 which pleased him no end. For some reason boats had to be in by 4pm which spoiled what was proving to be a good finale to the day. Lots of banksmen out and quite a few boats although some of those were on predator tickets hurling cutlery. Great news, Chris the warden said it would pick up this week with the arrival of the colder weather. I am up there tomorrow to do some bank fishing. Fingers crossed for some nymph fishing. Peter, the fish were high in the water even though they weren't showing so I would reckon a washing line technique from the bank. Had a couple of fish to small wet daddy on the top dropper. Well it was hard going today. I sneaked one out between the black clouds wind and rain, I thought the colder weather would bring them on but I only saw one fish caught on the boats and only had the one pull and fish myself. All the boxes were ticked, washing line, nymphs deep and shallow. My next visit is the 1st November lure fishing for the perch. Sounds a really tough day Peter. Were you fishing F1 or F2? I fished the west bank of both, conditions looked great but I only saw one fish move near the top. Funny you mention lure anglers, I thought it started on the 1st of November but I spoke to Mark and he said season ticket holders can start earlier. I did catch two small Jack pike from the Thames during a break in the fly fishing but had to hide under a tree during a down pour, not a good day to be on a boat. Bŕrrrrrr that was cold - went afloat today on F2. Surprisingly only one other boat out and just a handful of bankers. Chris pointed me to the SE of the lake and confirmed fish had been taken on the wl, well I gave that a good go along with straight nymphs, small lures and managed just one fish and lost one. Went walkabout and managed just one more fish so set up a di5 with lures and tried this back drifting malarkey. Cripes it can be cold work facing a NW with a chill factor of about 5c. Anyway a savage take to a white snake resulted in a fit 3lber and that was it. Gave it best at 3.45 just 15 minutes before the whistle and had a long drive home with the rush hour traffic. May just wipe my sword for this year unless we get some Clement weather with light winds. Cheers Doug.